Now, we travel to see differences, and I am always up for a cultural experience that is going to push me out of my comfort zone a little. Hence a year later I found myself in an Ethiopian beauty parlour (pink walls, 70s style pull-down hair-driers, satin cushions) with my Venus Adventures all-women tour group, waiting for a traditional “butter massage”. My Ethiopian friend Felekech had called me up whilst we were on the road and recommended it to me – she goes once a week – so I asked her to book us in. Sounded different – and interesting! In threes we were taken upstairs, stripped naked (get those knickers off you shy Westerners!) and lay on plastic-covered massage beds. 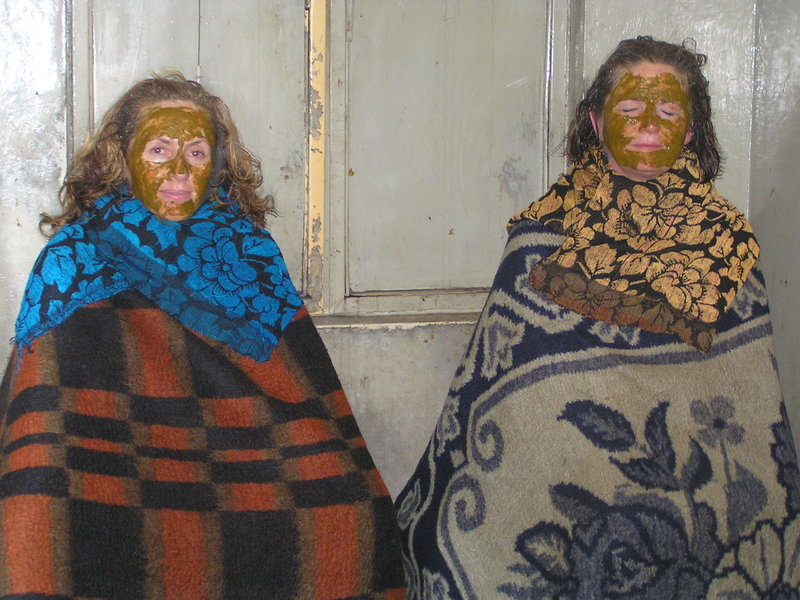 We then enjoyed a lovely 45-minute massage by beautiful Ethiopian attendants, albeit with butter (smelt and felt a bit odd! ), from head to toe, not forgetting a huge blob for our hair. There was lots of giggling and comments about how we felt like basted Turkeys. Once the massage was over we stood up, naked (except for a coating of butter, of course – a bit strange I know, but you get used to it). The attendant put plastic bags on my feet and hands…and then she put a dollop of butter onto my hand and pointed at my nether regions. (Er….you want me to do what?) OK, I got the picture and obeyed (yes, I was truly having a cultural experience, giggle giggle), now all nooks and crannies were nicely buttered, it was time for the basting…. A large cloak was draped around me and I was led into a room that had what looked like 3 long-drop toilets with small smouldering fires in front of them. I was seated over the hole in the “long drop”, my cloak draped over the box and the smokey fire, and three thick blankets wrapped around me to stop the smoke escaping, and to ensure I get a good sweat up. My knees were pushed apart as far as possible, smoke rose up all around my body, butter ran down my back, and my thoughts flashed back to the Afar tribe a year ago…Holy smoke, I was being smoked! Laughing to myself I recalled the Afar story to the other 2 girls getting smoked with me, and what Firew had said the outcome was. We could not stop laughing and joking during our half hour smoking session – what were we to do with our “reconditioned” nether regions?! All smoked-up and nowhere to go…! It took massive amounts of soap and shampoo to get all that butter off, but our skin did feel softer – and smelt buttery and smokey for at least 4 days. That evening we met Firew for dinner and told him we had been smoked – he thought it was hillarious “How do you feel?”, he asked. “Like an 18 year-old again” I said. Glad to hear that they did not stick a fork in you to see if you were done. Lookin’ good, lady!